Now click on "Manage Plugins" on the next screen. In the next screen click on "Available" tab. You get a list of Plugins, in this list there so many Plugin, in 'Filter' box we put 'Git Plugin'. Now we select the 'Git Plugin' check-box and press the "Install without restart"
Once all installations are complete, restart the Jenkins server by selecting " Restart Jenkins when installation is complete and no jobs are running " at the bottom of the page. Now login again to Jenkins dashboard. After Jenkins is restarted, Git will be available as an option whilst configuring jobs. 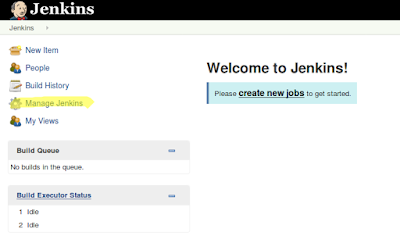 To verify, click on New Item in the menu options for Jenkins. Then enter a name for a job, in the following case, the name entered is ‘JenkisDemo’. Select ‘Freestyle project’ as the item type. Click the Ok button.